Within any established genre, I'm always impressed when a new band comes along and makes it feel vital again. It's been a long time since I listened to much rockabilly, but the Jim Jones Revue may make me revisit that stance. Then again, they aren't so much rockabillies as a garage rock and punk band that incorporates honky tonk piano and blues chords. 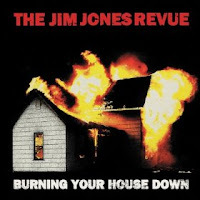 From the first track, it's clear that Jim Jones is a a wild and charismatic frontman. "High Horse" matches Jerry Lee Lewis sized carnal swagger with his ferocious key pummeling. Little Richard. On "Premeditated" his voice shifts between a guttural growl and a needle-in-the-red howl. It injects the songs with power and energy that evokes images of them thrashing about chaotically on stage. "Elemental" updates Little Richards' unhinged delivery for the 4 Loco age with a breakneck pace and blistering guitar riffs. Overall, it's a wild and fun album and is guaranteed to be amazing live. Come on out and see them blow the roof off Doug Fir Lounge on Saturday, September 3rd. Hell, if you consider the album cover a warning, it might be the last show that log basement ever hosts.